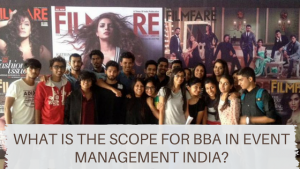 NIEM India Blog What Is the Scope for BBA in Event Management India? 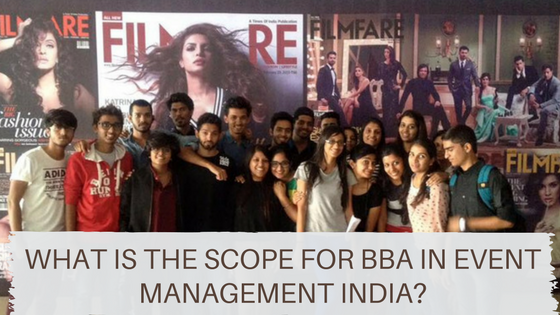 The course of BBA in event management is 3 years long in most reputed institutes. It hones skills like communication management, staff handling, planning of events, promotion techniques, Human Resource (HR) supervision, brand building, Public Relation studies, Advertising, Hospitality training, legal aspects of event supervision, finance handling and a host of other subjects. Theoretical knowledge of such subjects is of crucial importance to anyone looking to get into event management. Most reputed colleges providing this course, employ professionals with a great deal of experience. Their insight and knowledge about this industry can prove to be very valuable to anyone looking to build a career in event management. These professionals train these students in order to make them ready for the hardships that the industry may throw at them in the future. Anyone looking for pursuing event management studies should know that in this field, the experience is valued a lot higher than theoretical knowledge. No matter how much a candidate prepares him or herself theoretically, the professional field is a different ball game altogether. A standard BBA course in event management comes with a mandatory requirement of an ‘internship’ or ‘apprenticeship’. Leading companies in event management tie-up with such institutions in order to provide them with an internship of about 3 to 6 months. Since it is mandatory of the course, every student gets a hands-on experience dealing with real-life situations that empower them to increase their chances of getting a job. The internship certificate counts for some value in a resume, the experience, however, is priceless. A BBA degree is the bare necessity for anyone looking to pursue an MBA in Event Management. These MBA courses not only enrich the students with a higher degree of knowledge and repute, they also give the student a broader aspect of the industry. A BBA degree from a reputed institution not only vouches for the thorough knowledge of an individual about the subject but also increases his or her potential of becoming successful in his field. Event Management has become a glorious amalgamation of management and aesthetics. And there’s no denying that a BBA degree in event management holds a lot of value in this growing industry.